Antifa attacks police and reporters. Are the ‘anti-fascists’ truly anti-fascist? NBC News reporters covering demonstrations marking the one-year anniversary of the deadly “Unite the Right” rally in Charlottesville, Virginia, said they were attacked by protesters they identified as members of anti-fascist group Antifa. Perry noted in a separate tweet that protesters were being “very aggressive with the media,” sharing video of rallygoers placing their hands in front of his camera. So, Antifa wants to stifle the press and force people to accept its views. Well, that is a lot like fascism. The fact that it wants to also abolish capitalism (as the sticker at the beginning of this post states) shows that it has problems with private ownership of property and businesses. Antifa is autocratic and has repeatedly used forcible suppression of its opposition. While people certainly should be free to protest racism, they should do so peaceably. 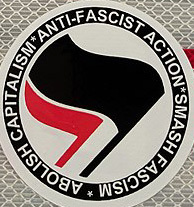 Violence, when it is supposed to be protesting racism, shows some of the hypocrisy of the Antifa movement–particularly when it was the press and police who were the main recipients of the violence. Getting rid of US President Donald Trump is one of Antifa’s ongoing themes. Multiple members of the progressive protest group who gathered outside the White House Sunday threatened President Trump with physical violence and murder. The Secret Service tells The Daily Caller they are now “aware” of the threats and are “investigating” the progressive protesters. People should not be making such death threats. Antifa has a history of violence as some associated with it believe in violent protest as was again shown this past weekend. 3 For your hands are defiled with blood, And your fingers with iniquity; Your lips have spoken lies, Your tongue has muttered perversity. 4 No one calls for justice, Nor does any plead for truth. They trust in empty words and speak lies; They conceive evil and bring forth iniquity. 5 They hatch vipers’ eggs and weave the spider’s web; He who eats of their eggs dies, And from that which is crushed a viper breaks out. A major divide is occurring in the USA. This is not good. Violence by protesters is wrong and should be denounced. Increasingly, the USA is becoming more polarized. Violence from groups like Antifa fan the flames. Partially because of that, we have seen many speakers and protests cancelled by US state and local government authorities this year. The reference to Samaria is pointing to the USA (see also Spiritual Samaritans: Old and New). The above is consistent with both civil unrest and terrorism. Expect more to hit the USA. Many of the right and left feel oppressed, they do not know how to do right, and they have stored up violence, and in ‘protests’ can display violence and robbery. Violence, itself, often begets violence. So, sadly, we seem to be seeing more and more protests and terror. There is violence in the USA. We are seeing increased civil unrest in the USA, by groups like Antifa. We will see riots in the USA. Notice the violence is prophesied to get worse. So much so that Gentiles will one day come and take possession of houses–this will happen to the USA during the Great Tribulation (see also When Will the Great Tribulation Begin?). National repentance is the only way to prevent it, and that does not look likely. Personal repentance, however, is still possible. If you are an American, your personal future can still be much brighter than that of your country. Though for the nation, the Kingdom of God is the solution, but the USA will first have to go through a horrific 3 1/2 years. The end of the USA/UK world order is coming and the final Time of the Gentiles is getting nearer. This entry was posted on Monday, August 13th, 2018 at 6:40 am	and is filed under Prophecy.